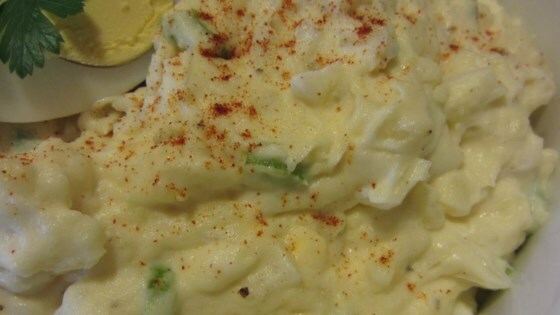 "Mashed potato salad that can be made with or without the chopped egg. This is the only kind of potato salad my dad will eat; try it and you'll see why." Place potatoes into a large pot and cover with salted water; bring to a boil. Reduce heat to medium-low and simmer until tender, about 20 minutes. Drain and transfer potatoes to a large bowl. Mash potatoes with a potato masher. Stir in onion, eggs, celery, pickles, salt, and black pepper. Mix mayonnaise, pickle juice, and mustard in a separate bowl; pour over potatoes and mix well. Cover and refrigerate at least 1 hour before serving. This was my mom's recipe, but she used Miracle Whip instead of Mayo and dill pickles instead of sweet. For a meal, she would fry some baloney and fill them with warm mashed potato salad. Awesome very easy to make! Made it for dinner today and the family loved it. The only part I didn't like was peeling the potatoes but is was worth it! You got to try it. Very simple recipe yet very, very tasty! Stayed true to the recipe and it was a hit. This one's a keeper!